Telecommuting Millionaire? 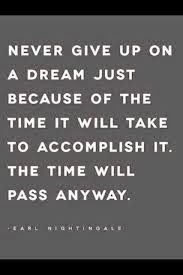 : Never Give Up on Your Dream! I specialize in introducing my readers to successful ways to work from home and become wealthy. My goal: Gain wealthy and influential friends by helping YOU become healthy, wealthy and wise! What can I say? Time passes. Are you still fighting for your dream or have you given up on it? My dream has always been the same - (1) to be a successful business woman making six-figure income from my own business and having the freedom to enjoy my family and loved ones. (2) To write for a living and do all the things that I love to do so that work feels like FUN. (3) To help people gain their dreams so that I can have powerful and influential friends. I hope you have joined me in my adventure. Do me a favor . . . Click one of the icons below and share this article with friends! Leave a COMMENT by clicking on the little orange "comment" below right by "written by Telemill" notation. Let me know what you think! Really, I am interested. Follow this blog by Email - Convenient huh? Interested in a particular topic? How do music stars go bankrupt? What should you do if you get BIG MONEY! All Rights Reserved 2007-2014 (c) Rosalind Mays Welch. Simple theme. Powered by Blogger.